Parenting is complicated. Following an easy to remember framework simplifies your parenting and helps you become a more thoughtful, more intentional, parent. Connected families are joyfully connected to God, each other, and God’s purposes for their lives. When parents learn to put this way of thinking into practice they tell us it puts God’s grace and truth front and center in their homes, and changes them – and their kids – for good! Parents start by strengthening their own spiritual and relational foundation of safety and grace. The solid foundation then helps bring God’s love into everyday life, empowering parents to enjoy and connect with unconditional love. 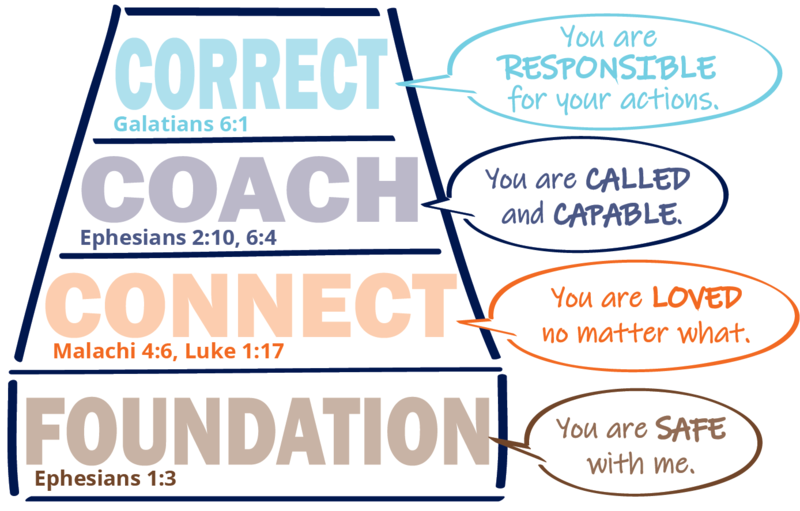 Connection creates opportunities for parents to thoughtfully coach their kids toward God’s truth and purposes for them. When sin and misbehavior show up it’s time to correct in ways that disciple kids to take responsibility for their sin, their relationships and their lives. This proactive approach to parenting highlights God’s best for kids and parents alike. Check out the three minute video below to get an overview, and then dig in and grow your Connected Family! Request our free ebook 4 Messages Every Child Longs to Hear: A Discipline That Connects Overview.